On Friday, July 1st, 2016, at approximately 2:59 p.m. El Dorado County Sheriff’s Dispatchers received a phone call reporting a bank robbery at the Chase Bank, 2215 Francisco Drive in El Dorado Hills. Deputies, Detectives and a CSI Team responded immediately and obtained suspect information during their investigation. The suspect had fled the scene via unknown means with an undisclosed amount of cash prior the Sheriff’s Office receiving the call. No one was injured during the commission of the crime. The suspect claimed to have a gun, however, the presence of a gun cannot be verified at this time. 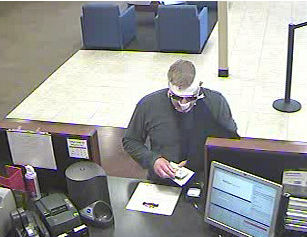 The suspect was a white male adult with a large build wearing bandages and sunglasses on his face. Additionally, the suspect wore a sling on his left arm. Photographs of the suspect are included below and we are seeking the public’s help in identifying him. Anyone with information regarding the robbery is encouraged to contact Detective Simon Brown at 530-642-4707. Possible suspect sightings should be reported by dialing 911, reference case EG16-5797. Due to the suspect claiming to have a gun, he should be considered armed and dangerous.